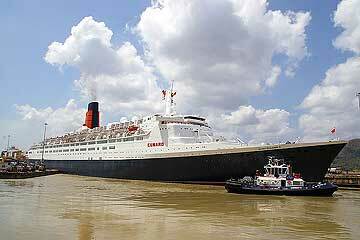 The RMS Queen Elizabeth 2 (QE2) is a Cunard Line ocean liner. 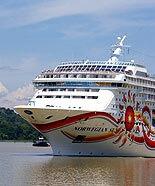 She was the flagship of the line from 1969 until succeeded by RMS Queen Mary 2 in 2004. Built in Clydebank, Scotland, she was considered the last of the great transatlantic ocean liners prior to the construction of the QM2. 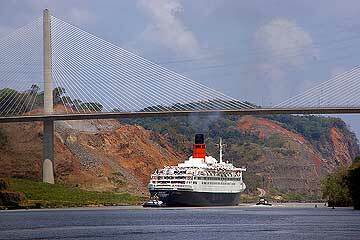 The QE2 had a top speed of 32.5 knots using her original steam turbine power plant, which was increased to 34 knots when she was re-engined with a diesel electric powerplant, making her the fastest passenger ship afloat at the time. 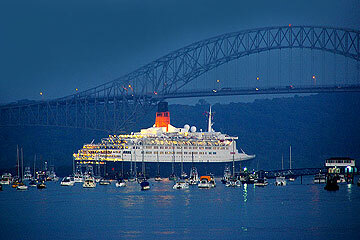 These images show the QE2 April the 5th, 2008 on her last Panama Canal Transit before she will be retired from active service in late 2008, to become a floating hotel in Dubai. The RMS Queen Elizabeth 2 (QE2) has sailed 5.5 million nautical miles, that's more than any other ship ever and the equivalent of traveling to the moon and back 13 times and carried almost 2.1 million guests.